 The ESI 60 Business Phone by Action CTI is ideal for most active phone users. Its large display and 48 programmable feature keys help your Houston area or Woodlands, Texas business achieve maximum productivity. Programmable keys: 48 [up to 168 with optional Expansion Consoles attached]. Display: Upper and lower, each with adjustable backlighting. Upper display is three-line, 56-character. Lower display (which shows settings of programmable feature keys) is 16-line, 13-character. 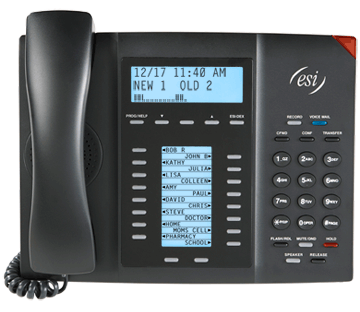 ESI 60IP Business Phone, in Gigabit Ethernet and 10/100 Ethernet versions — Provides the same great ESI phone capabilities as does the ESI 60D Business Phone, yet with the additional advantage of “one-wire” VoIP (voice over IP) telephony. Works both locally (LAN) and remotely (WAN or Internet). Uses either Power over Ethernet or regular AC power, to maximize your connection convenience. *Note that the ESI Communication Servers must be IP-enabled for the ESI 60IP Business Phones to work.